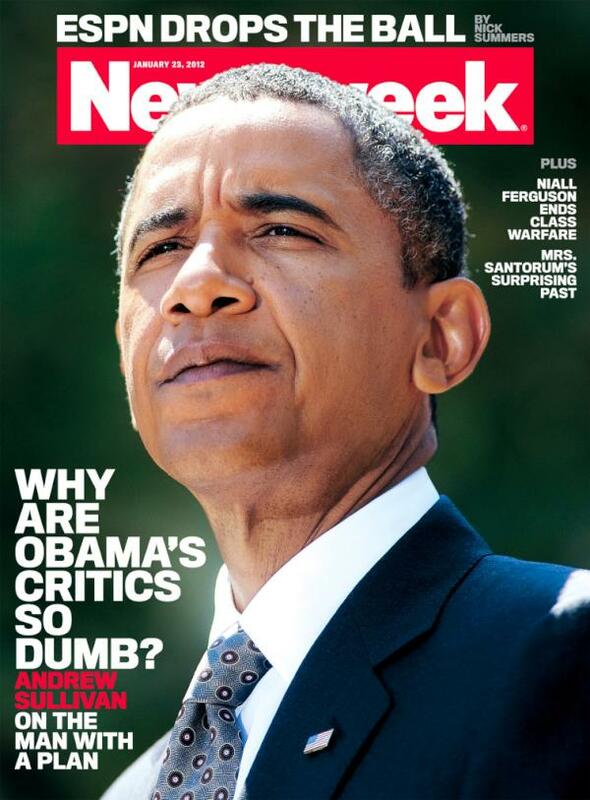 This weeks cover story for Newsweek, written by fake conservative Andrew Sullivan, asks the burning question: "Why are you so dumb?" Apparently, the unwashed masses do not see how Obama holds out an extreme leftist view, gets attacked for it, then actually implements some moderate idea that the people with brains all sing and dance around or.....something.Unfortunately the entire article is full of liberal "facts" that just dont add up. It's basically the same 'ole line "BUSH DID IT!" and Obama had to clean it up. That line isn't working any more kids. Obama has no idea what he is doing-the out-of-control debt, soaring unemployment, business killing regulation and a housing market that has NEVER in history been so bad, show us that. Enjoy your fantasy Mr. Sullivan, the time for waking is near.